Innovation is defined as value captured through the implementation of creative ideas. The single biggest factor in successful innovation is company culture. 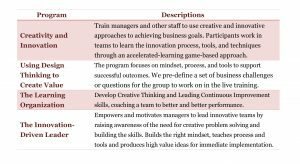 Without cultural change and serious commitment from leadership, producing value through creativity (innovation) is very difficult to achieve. companies must increase awareness of opportunities for and the necessity of innovation throughout the company and equip employees with the skills and processes to be truly innovative.